Karen immediately dug through her mental rolodex of recipe majesty, a good thing because my brain was more fried than a bucket of chicken from the Colonel. She remembered a fabulous black bean cake recipe from Emeril Lagasse would be perfect to make. I was relieved for her quick wit and paired the cakes with a fresh pineapple salsa enlivened with piquant red jalapenos and a simple avocado crema made with greek yogurt and lime. The final result was ridiculously good – a composed plate that looked like it should be served at a fancy pants restaurant rather than the picnic table in my backyard. Plus, the time we spent cooking was a welcome respite from the piles of work in front of me. Good times! Mix together the pineapple, onion, jalapeno, cilantro, lime juice, olive oil and season with salt and pepper. Set aside. Add the greek yogurt, avocado, olive oil and lime to a food processor and blend until completely smooth. Season with salt and pepper and chill until ready to serve. Heat a large pan over hight heat and add the 1 tablespoon of the olive oil. Add the onion and cook until translucent. Next add the garlic and cook until fragrant. Set aside while you make the filling for the cakes. Throw the beans into the food processor and pulse until roughly chopped, like chunky refried beans. Pour out into a bowl and mix with the onion, chopped cilantro, egg, salt, pepper, cumin, coriander and chipotle sauce. Stir to combine and then scoop out into 1/4 c. portions. Heat a skillet on high and add the remaining 6 tbs. of olive oil. In a small bowl, mix the flour and cajun seasoning. Flour the patties on all sides ad add to the hot pan. Cook the cakes for about 3 minutes a side or until golden, using an offset spatula to carefully flip them. 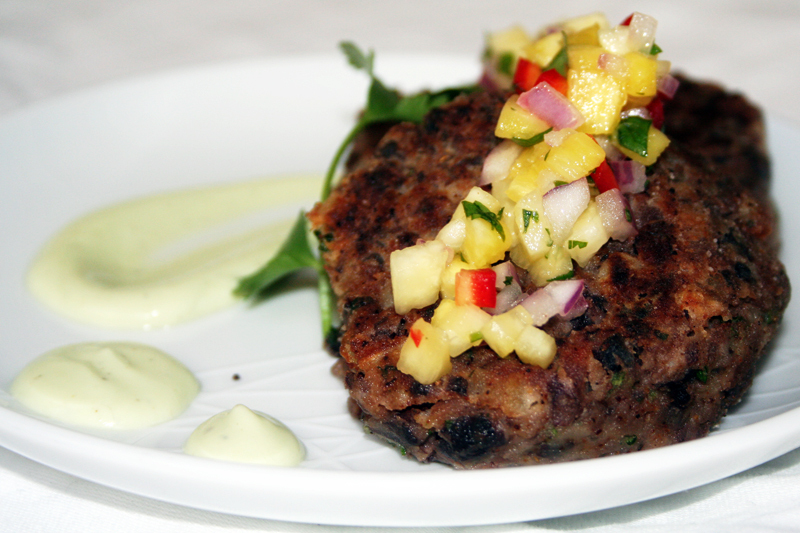 Serve with the pineapple salsa and avocado crema. 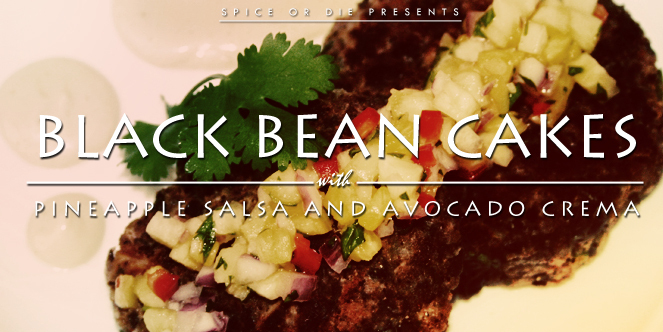 I LOVE LOVE LOVE black bean and pineapple and your burgers and salsa sounds so tasty and I will be making them very soon and fabulous result on this challenge and it nice that you have a cooking friend. The colours are so vibrant. Cheers from Audax in Sydney Australia. Oooh … This looks tasty. I have subscribed to your feed so I can see what else you’re doing. Thanks for connecting with me (Food Stories Blog) on foodbuzz! I have never made the bean cakes and its a new discovery for me. I would love to try out and wonderful pairing with the salsa and crema. Nice use of avocado. It would be super if you linked this post in to <a href=”http://caroleschatter.blogspot.co.nz/2012/06/food-on-friday-avocado.html”> Food on Friday </a> Series which is all about avocado this week.